• Graben are systematically arranged around sources of volcanically generated stress, lithospheric loading or regional stress. • A common sequence of region wide stress events that correlate with graben direction and orientation of channels of differing morphology. • A development sequence for the NW Elysium Province is proposed using graben orientation and channel direction analysis. The northwest region of the Elysium Volcanic Province includes volcanoes, large outflow channels and narrow straight valleys called graben. We noticed that some outflow channel shapes matched, and nearly all graben were arranged in lines, curves or clusters. Analyzing these arrangements we identified a sequence of geological events that could have created the Province. 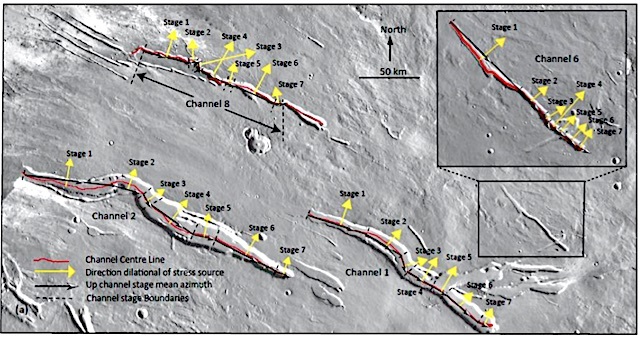 With mapping and analysis we have shown the outflow channel directions, and the location and direction of graben, have been controlled by the same tectonic forces.As events changed in time the force direction also changed, allowing us to identify probable events, for example volcano growth. We suggest the Province elevation increased as magma rose from the Martian interior; then the Hecates Tholus volcano increased in size; followed by the growth of Elysium Mons, the largest volcano in the Province. We suggest some lava erupted by Elysium Mons flowed away in subsurface channels called dikes to the surrounding Province, creating graben similar to some features seen in the northern Canadian Shield. This entry was posted in Reports and tagged Elysium Mons, graben, Hecates Tholus, lava channels, tectonics, volcanics. Bookmark the permalink.